Re-entering the workforce, super-mum Lisa lands her dream job! Lisa Roberts, enjoying her new Groundsperson role at New Directions Care after re-entering the workforce, thanks to the Skilling Queenslanders for Work program. She is seen here with Adam Farrley, Handyman for New Directions Care. After devoting fifteen years to raising her four young boys, Lisa Roberts had the opportunity to revisit her career path and find a job she truly loves. Like many mothers re-entering the workforce after a long period, Lisa found it was difficult because employers were often looking for recent workplace skills. Having always had a love of nature and gardening, Lisa used the opportunity to reskill for work that she had always wanted to do, enrolling in a Certificate I in Conservation and Land Management as part of a project through Reclink Australia, funded through the Queensland State Government initiative, Skilling Queenslanders for Work (SQW). 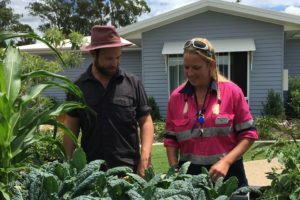 Lisa excelled in the training and has now found full-time work as a grounds-person at New Directions Care, a residential aged care provider in Bellmere, Queensland. An inspiration for many mothers re-entering the workforce, Lisa believes that the time dedicated to raising her family has given her a new perspective that allowed her to follow her dream. Thanks to Skilling Queenslanders for Work, Reclink Australia and BUSY At Work, she is now living that dream! “Raising children is one of the most rewarding times in our life and for parents, re-entering the workforce doesn’t have to be a struggle. Programs like Skilling Queenslanders for Work are readily accessible and we encourage anyone who has been out of the workforce for a period of time to find out more”, Managing Director for BUSY At Work, Paul Miles stated. In partnership with Reclink Australia, BUSY At Work (an Australian Apprenticeship Support Network provider) will be looking to sign up a further 174 trainees in five separate projects over the next 12 months. The upcoming projects offer 22 weeks of full-time paid employment and valuable skills for persons wanting to kick-start their career in industries such as Construction or Conservation and Land Management. Projects are starting soon in the Caboolture and Logan regions and there are upcoming projects in the Bundaberg, Springhill, and Jimboombah regions.